Does your pet suffer from a chronic condition like arthritis, or a persistent skin condition? Perhaps they don’t respond to conventional medication? Or maybe you’re looking for a natural treatment that doesn’t involve drugs and prescriptions? 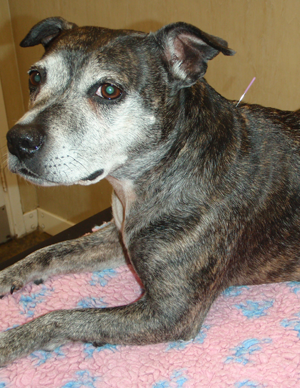 Have you ever considered acupuncture for your pet? Acupuncture is a traditional method of Eastern medicine which has been used to successfully treat pain and other conditions for thousands of years. It involves inserting tiny needles into particular acupressure points on the body, which work to unblock energy channels and relieve symptoms. At The Shrubbery, our Clinical Director Natalie Devleeschouwer is additionally trained to carry out acupuncture treatment. The first appointment will involve taking a full medical and behavioural history from you about your pet, followed by the treatment itself. All subsequent consultations will be around 30 minutes long. Acupuncture is a technique where specific needles are inserted into specific points on the body to produce a healing response, such as relieving pain and other therapeutic purposes. Acupuncture originated from China and now is used in conjunction with Western medicine. Scientific research has made enormous progress over the past 40 years and now explains some of acupuncture’s actions. Early research focused mainly on pain and the release of pain-killing chemicals from the brain in response to acupuncture. However, further investigations have revealed more widespread effects involving neuro- hormones and the autonomic (involuntary) nervous system. Which species can benefit from acupuncture? Acupuncture is widely used in dogs and cats, but can be beneficial in birds and rabbits too. For Which conditions can Acupuncture be used? It can also help any chronic pain which is not being controlled by conventional treatments, or when a pet is suffering from side effects. For more information about the benefits of acupuncture, or to discuss the ways in which it could help your pet,please call and speak to a member of our team on 01474 534891.